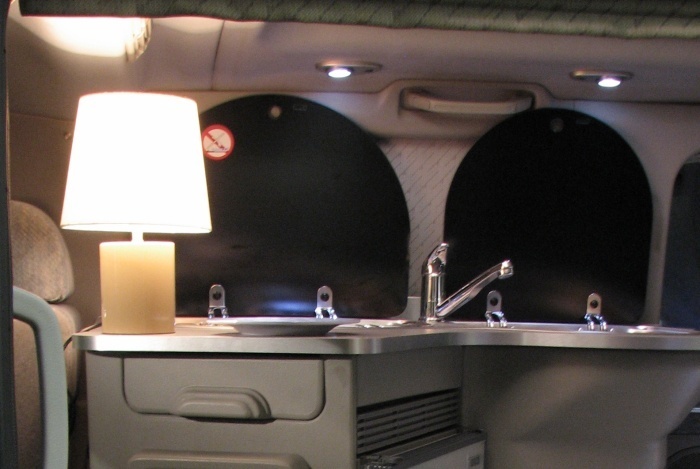 The Moonfleet is positioned in the mid-range of our highly acclaimed campervan conversions. It provides a remarkable balance between convenience and cost effectiveness, while conceding nothing in terms of interior elegance. The Moonfleet retains its rear windows so that passengers, loungers and diners can enjoy unrestricted views of sunsets over nearby islands - or just while travelling. 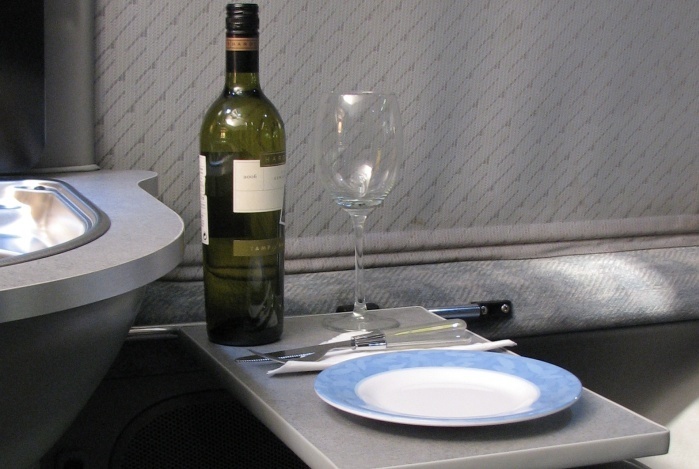 For dining, two compact tabletops clip securely to rails at either side of the interior. Downlighters provide illumination when the sunset has finally faded. 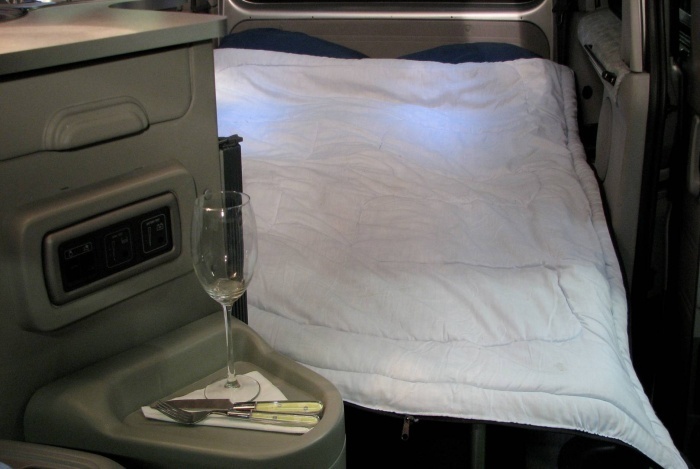 During the day and while travelling, bedding can be stored within the rising roof, whilst further boot space for large items is to be found beneath and behind the sliding seat. The Moonfleet benefits from the kitchen first seen in the top of the range Lulworth. The elegantly sculpted curves of the island unit and worktop are complemented by the gleaming stainless steel three-burner hob and sink unit. The flush smoked-glass lids supplement the worktop, while a thoughtfully designed slide-out worktop extends even further the usable surface area. The kitchen facilities are completed by a 45 litre on board fresh water tank, sizeable 43 litre Waeco compressor refrigerator with full width freezer compartment, next to a shelved cupboard with enhanced capacity thanks to the novel solution to gas bottle storage. 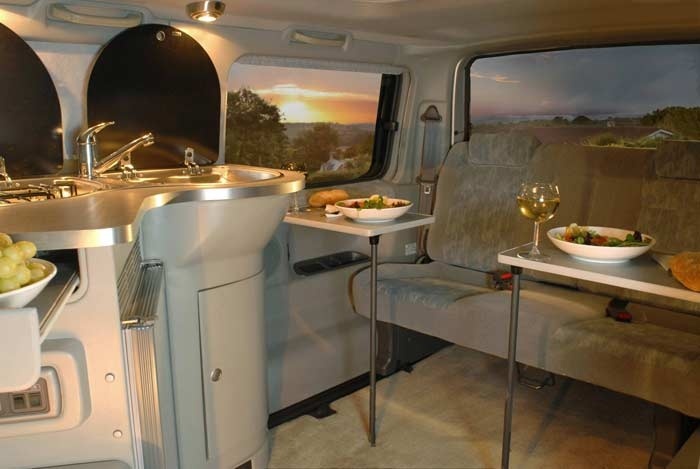 With elegant functionality that would not disgrace a far larger campervan, it’s hardly surprising that one national magazine described it as ‘the best kitchen available by a country mile’. An Elecsol 100 amp battery provides on site power for the refrigerator, lights and other 12 volt accessories when there is no mains hook up. Both 12v and 240v power is managed by a control unit, LED display and, safety once again, an RCD and trips. In the Moonfleet the gas bottle is safely accommodated in a ventilated cabinet whose curves reflect those in the rest of the kitchen and whose sculpted top serves as a neat resting point for drinks. The original rear seat is retained for safety while travelling and can be reupholstered to form part of a luxurious flat surface for sleeping on once coupled to our unique bed extension. With the bed narrowing to the foot, the full width of the interior is utilised resulting in a deceptively large double bed. The unique electric rising roof opens up for daytime standing room, then cleverly turns into nightime accommodation. Even tall adults might elect to stretch out in the 7ft long bed. Drive into the sunset with a Moonfleet from only £14,995. The original seat is retained in the conversion but an optional re-upholster service flattens the bed to ensure a superbly comfortable sleeping surface. Because we are using the original mounts & mechanisms, the seat is as safe to travel in, for you & your family, as when the vehicle left the factory. The vehicles themselves are equipped electric lifting roof, power steering, central locking, electric windows, electric mirrors, fitted blinds & twin air conditioning or climate control. The vast majority of vehicles we stock also have drivers or twin airbags, 4 wheel ABS anti lock brakes, alloy wheels & electric folding door mirrors. Imperial Leisure Vehicles Ltd. 494 Blandford Road Hamworthy, Poole, Dorset, BH16 5BN.